Suraj and his elder brother Amar became displaced from their family, lived at another organization and lived homeless on the street for a time. A man promised to bring them to an orphanage but later abandoned them near Swayambhu. As Suraj was very sick and couldn’t go far, so they slept at the monkey temple. The locals were concerned for them and directed them to Umbrella where they lived in our homes since September 2007. Amar has now graduated and is doing well these days, working as a trekking guide. Suraj had just completed his SLC and was making preparations to enter the NSYEP when a shocking confession from Amar changed everything. As part of the NSYEP, the youths are assisted in getting their citizenship documents – an essential criteria for college courses, trainings and entering the workforce. With Suraj having just completed his exams, Amar was due to take him back to their village and get the appropriate documents signed. Easy. Or so we thought. ‘Brothers’ Suraj and Amar at Umbrella’s Annapurna Boys’ Home in 2011. In fact, Amar revealed that he wasn’t Suraj’s brother at all! They met on the street and came to care for each other as brothers. They never told the truth as they just wanted to stay at a safe place and as time passed, the lie grew and they didn’t dare to tell the truth in case they would be split up. This came as a big shock to everyone as it meant that all background information on Suraj was false. It meant we were back to square one. The process of family tracing can be very lengthy and daunting – like looking for a needle in a haystack. It could have been disheartening for the team but it wasn’t. Instead, Gopal, the Child Protection Manager, was fired up and ready to see this case through to the end. He met with Suraj to help him recall early childhood memories and see what they could piece together. 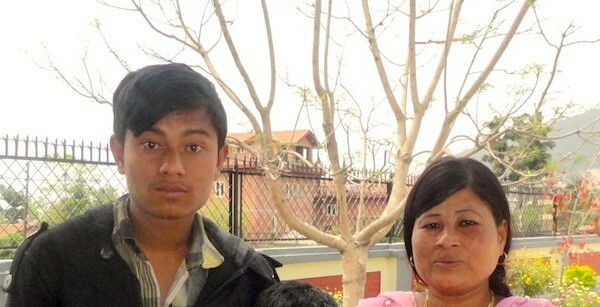 Suraj remembered that they lived in a particular area of Kathmandu and his mother was working in a carpet factory at the time. He didn’t like school, ran away from home and became completely lost from his family. 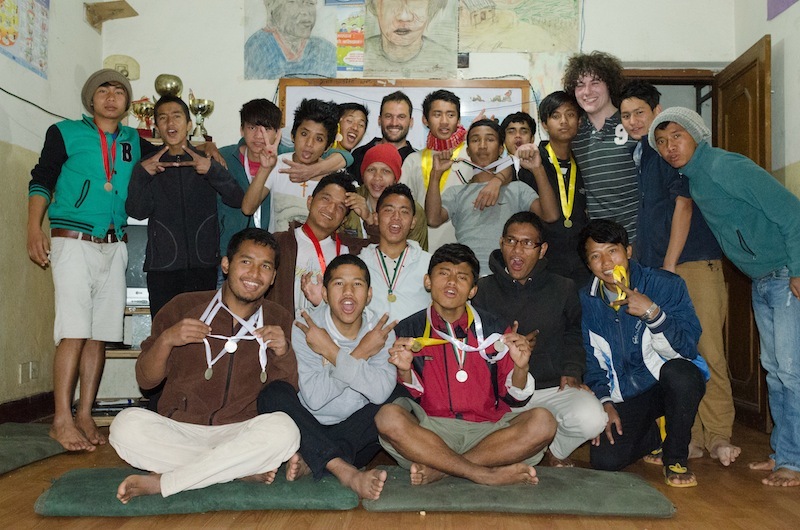 Suraj pictured with the boys of Annapurna House and volunteers Marco (Italy) and Mikey (Ireland). So that Saturday, Gopal and Suraj set out to visit all the carpet factories in that area and learn if anyone knew or remembered his mother. Gopal guessed that if his mother was a factory worker then he would have attended a public school, not a private one. So, they planned to visit one. It was a Saturday and so it was a gamble as everything should have been closed. Luckily, there were teachers and painters there renovating the building. Unluckily, it meant that Suraj couldn’t recognize it. Gopal spoke with them, explaining the case of the missing son 7 years ago and they were inspired to help. Suraj recalled being taught by male teacher with long hair who was very strict. The teachers and painters knew his description – they were in the right place! They began the task of searching through old enrolment registers, going through the dusty documents year by year. They found ‘Suraj Maharjan’ in the register of 7 years ago and sure enough, the records showed his attendance for 4 months and that he had left. They were getting closer! They contacted the principal who remembered that once a mother came to tell her about her son she had lost 3 years ago and was desperately looking for him. So they continued on, visiting 13 carpet factories with the help of some locals who brought them to the oldest carpet owners and factories. They told the story and left contact information there. On the way to one of the factories, Gopal recounts a strange incident of fate “I met four people in a shop. What drove me to stop there I don’t know. But I just stopped my bike and told them why I was there. There was a lady who had lived there all her life. When she heard the story of Suraj, she recognized them as her tenants 7 years ago. Everyone was surprised. I passed many people and many shop on the way, but why I stopped there and why I would like to tell the case – it was a lucky coincidence.” The woman said that they lived in her house for a year and moved away but she met his mother just 3 months ago in the area! It meant she could still be there! 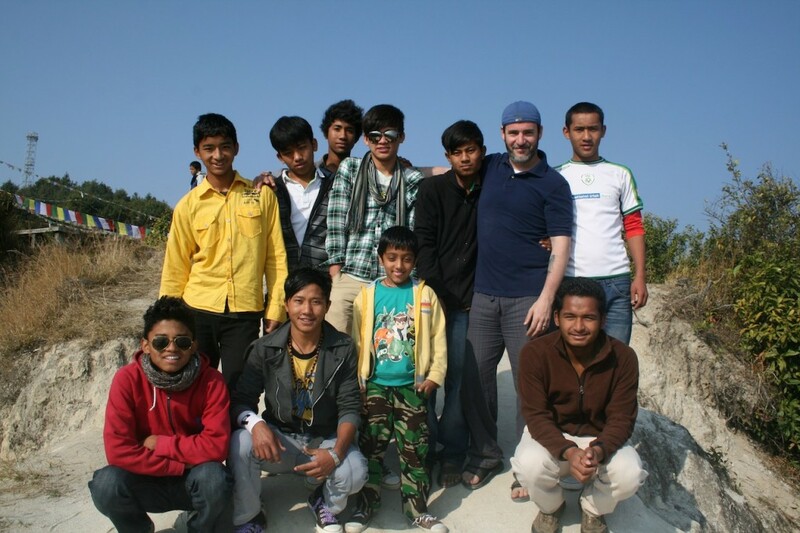 Suraj pictured with the boys and Housefather of Annapurna in 2013. After a long but successful and lucky search, they were both tired and went home. Gopal was planning to return again, revisit the schools for information – perhaps he had sibling there? - and go to the mobile service providers to see had anyone taken out a phone in his parents names as telephone companies keep copies of citizenship documents. A long shot but worth a try. Just five days after their first visit, Gopal got a call in the evening from a lady asking him to come the next day. He didn’t know who it was and assumed it was someone with more information. When they arrived there to meet her, Suraj stayed behind Gopal. He was nervous. The lady led them to a big compound with a beautiful garden and went to get them chairs. Gopal described the moment: “Do you recognize her?” I asked. “No.” he replied, disappointed. I smiled at him. Then he asked, “Is she my Mom? What do you think?” His face changed and I easily noticed his eagerness to see her again to confirm. He could not directly see her when she came back so I requested her to sit in front of us. I noticed Suraj’s face light up with happiness. He even could not close his mouth and cover his teeth. I saw rolling tears in his mother’s eyes. She just bowed her head and wiped her eyes. I always want to see that moment in children and their parents. It really gives me the energy to put much effort into a child’s case.” She confirmed her name and her lost sons name. They had found each other at last. After giving them a moment together, Gopal wanted to piece together everything that had happened. It turned out that she had left her job in the factory and had been working as a gardener in the compound in which they were sitting. Her husband was living in their village, caring for his parents. However, just one month ago she too had left Kathmandu permanently. It was utter chance that she was there now. The owner of the garden was going abroad and asked her to come back to Kathmandu for five days to look after the house. She hadn’t visited her old home in more than a year but fate intervened again, and she decided to visit her old house owner. The lady told her about the visit on Saturday just 5 days before and gave her the telephone number. After 7 years, Suraj finally has his true identity and family back – a younger brother and sister who were infants when he left, his parents who spent years in search of their lost son and his grandparents in the village. He and Amar share a bond that means they will always be brothers. However, the hard work of the Umbrella team (and a lending hand from fate!) means that he can now be where he belongs. Suraj is now in his village with his whole family – he was so excited as he had never been there before. 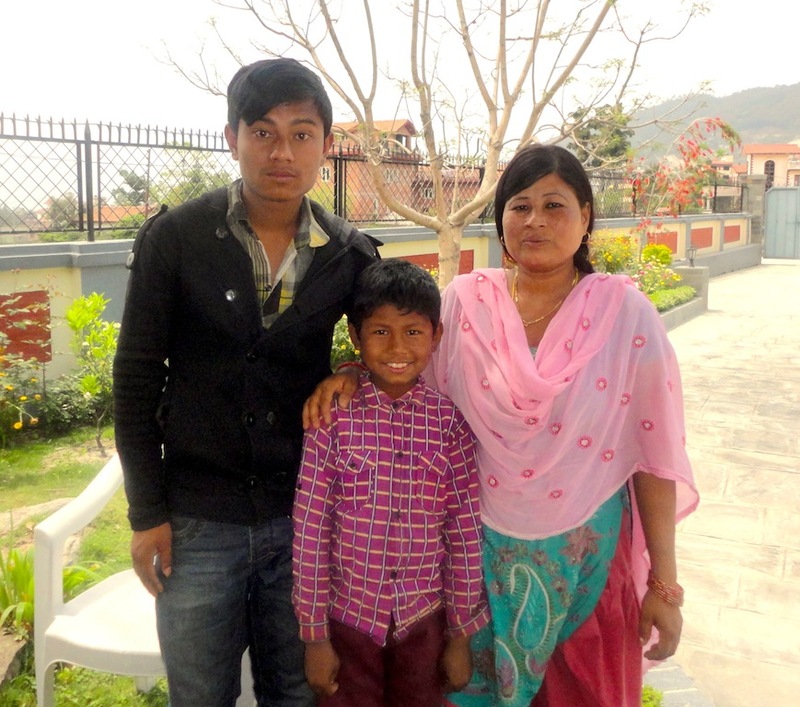 Suraj with his younger brother and Mother – reunited after 7 years.